Poaching big, plump shrimp in a seasoned broth gives them lots of flavor—but if you’re pressed for time, you could get away with buying cooked (don’t skip the final seasoning of oil, lemon, chile, and chives, though). 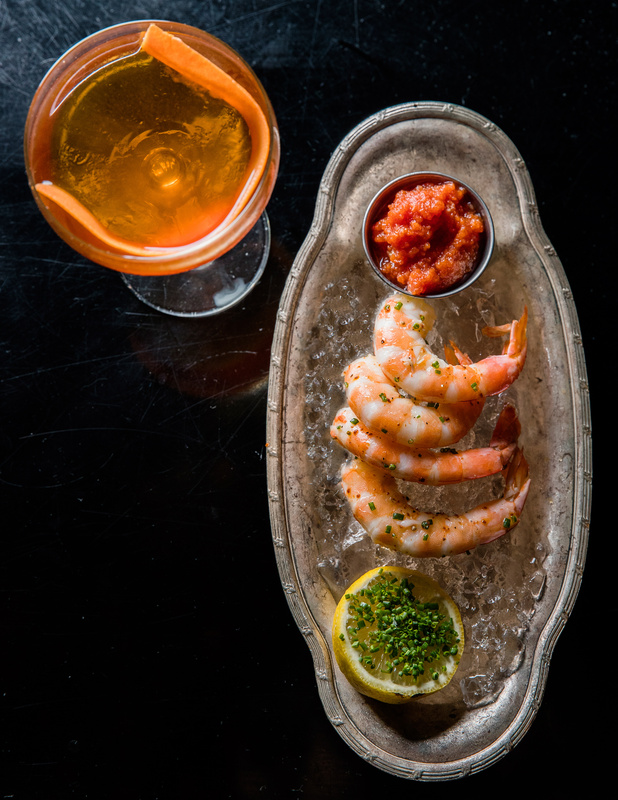 The recipe is from in San Francisco, where it’s plated as an individual serving of a few shrimp directly on crushed ice. Since this recipe serves a group, and sits out for a while, the shrimp are in a bowl nested into a larger bowl of ice—it makes refreshing the melted ice much easier. Heat canola oil in a 6- to 8-qt. pot over medium heat, then add onion, thyme, bay leaves, and Old Bay. Cover and cook, stirring occasionally, until onion is softened but not browned, about 10 minutes. Add wine and 2 qts. water. Cover, increase heat to high, and bring to a boil. Reduce heat to low to keep broth at a bare simmer. Add shrimp and simmer just until they begin to curl and turn pink, 2 minutes (they'll keep cooking off the heat). Drain into a colander over a large bowl (save broth for soup), then spread on a rimmed baking sheet and chill until cold, at least 30 minutes. Peel shrimp down to last segment (leave tails on) and put in a wide serving bowl. Chill. In a small bowl, whisk cocktail-sauce ingredients. To shrimp, add olive oil, lemon juice, 1 tbsp. chives, and the Aleppo pepper and turn to coat. Dip a cut side of each lemon wedge in remaining chives. Fill a very large wide bowl with crushed ice and set bowl of shrimp on top. Add lemons and serve with cocktail sauce. Make ahead: Sauce, up to 1 week. Shrimp, through step 3, up to 1 day; through step 6, up to 45 minutes.